Your putting posture and style of putter should be a match. 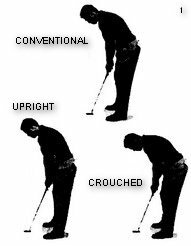 To my mind you should focus on your posture first, and then use a putter that works best with this posture. Putting postures vary from upright to crouched. Todd Sones gives this advice to achieve what he considers to be the ideal posture. Stand with your weight balanced in the middle of your feet and then tilt forward so your arms hang straight down, palms facing with a slight elbow flex. In an upright posture your arms and shoulders move more around than up and down. This means that when you swing your putter, your stroke will travel in a curved arc. If you try to keep your putterface square to your aimline (target line), your arms will move independently of your shoulders. This introduces a mismatch between your stroke and your posture. In a crouched position your arms and shoulders move more on a vertical plane. When you swing your putter, your stroke will have little or no arc to it. If you try to work your putter in an arc, you will be forced into manipulating your hands and your arms. Whether your posture tends towards an upright (or a crouched) position, is a matter of personal preference. For example, a golfer with a bad back may choose to stand taller. Another with poor eyesight may choose to bend down closer to the ball. If you compare the postures of Jack Nicklaus and Phil Mickelson you will see both ends of the spectrum. What is important with any putting posture is that you don't fight the path that your putter wants to follow. As soon as you start overriding the way the putter naturally swings, you are in trouble. 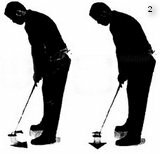 Once you have found a comfortable position and accepted that with this posture your putter will swing in a certain way, you are ready to find a suitable putter. If your putting stroke swings in a curved arc around your body, you should probably choose a heel-toe weighted flange putter. This is because the distribution of weight helps the putter to open and close - matching your stroke. A heel-toe weighted putter works contrary to a putting stroke that has little or no arc to it. A face-balanced putter, such as a mallet putter, is more forgiving of putts that are struck either side of the sweetspot. The dynamics of the putter work to keep it from opening and closing. This type of putter works best if your putting stroke follows a more straight back and through path. Putting in sync is all about matching the variable of posture and putter. The best results comes when there is a perfect match.